I noticed that nobody had updated an article on these things since the move to an internet database, so I guess I will. Description: This aberrant is one of a long line of Fearsome Critters, supposedly mythical beings who were talked about in lumber camps during the turn of the 20th century. 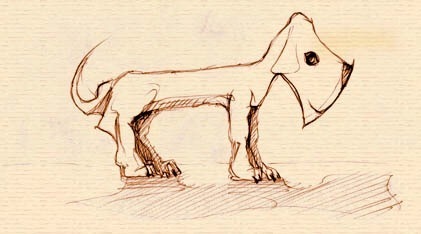 The Axehandle Hound is one of the lesser known beasties of this type, with things like the Jersey Devil overshadowing it. The critter in particular looks like it came straight out of a gag book or some sort of weird acid dream. Axehandle hounds are just that, hounds which are shaped like axes. I’ve been around a couple of the fellas. They may look really weird at first, but the look grows on you the more you stay around them if you can get past the constant furniture-chewing they do. Axehandle hounds come in all shapes and sizes, kind of like regular dogs do. If I were to say what most of them resembled, they'd be kind of like a dachshund mixed with a sprinkle of a beagle. Maybe one day somebody decided to throw a hatchet and a dog into a blender and somehow we got this result? I wouldn't know. Anyways, if you ever see these little beasts in the wild, you'll usually find them headbutting their pointy faces into trees and letting loose bark and wood chips everywhere. After they do this, they'll eat whatever came loose. That’s right. They eat wood chips. Occasionally, if they can get to it, they’ll chow down on things made of metal. Axehandle hounds have been seen attempting to hunt small game, but this only happens once in a while if for some reason they can't find any wood to fill their bellies. Perhaps due to their diet of both wood and metal, their heads are really hard, and the rest of their body very sturdy. Because of this, they'd probably make a good hatchet, but we don't advise that you do that! Axehandle Hounds live on average a whopping forty-two years, so they’re a life long commitment. If you're in the area, give me a call and I'll see if I can't set you up with one. They're really amazing creatures. One of my favorites here at the Bugfoot Sanctuary! Background: Other than the fact that it’s considered a Fearsome Critter, we currently know nothing else about them. In the original story, these things were supposed to be going around eating axehandles from unattended axes and then running away. Considering their appetite for trees and such, I wouldn't doubt that the lumberjacks who told the tale would be the first to hear of them. Ever since this fearsome critter has come into the eye of the Society, they have remained faithful companions to Warders who seek them out, even if they haven’t really turned into anything useful when it comes to hunting. Hey, at least they’re still cute. Location and Population: Ever since Society intervention in the mid-1900s, wild populations of Axehandle Hounds have declined drastically. Nowadays, you’ll either find them at numerous Society-affiliated bestiaries like mine or in the homes of the people we adopt them to. The current population, if the survey we sent out a while ago is accurate, is around four hundred. Hunting or Procurement Advice: If you happen to see one in the woods, you can just take out some ammo shell casings and give it to them. They're like treats. After that, they'll come up to ask for more and you can just scoop them up. Additional Notes: Be sure to check out some of our litters at the Wayweird Sanctuary! It also doubles as a DCC, so maybe while you're here to pick up a bounty or something you could be able to check them out along with a couple of other adoptable aberrants! We're located in Ligonier, Pennsylvania. Adoption Requirements: I ain't giving these things out to any Red Ryders or people who are just gonna throw them to some nasty red-rated cryptid as a distraction. To adopt, I need at least one recommendation from an existing owner of any of our aberrants and another from a ranger. We also require a check of the home they are to be housed in to see if you are a good fit. We usually train them not to, but we suggest these pets for those who can handle that their wooden furniture might be chewed on a little bit.